A rare creature weighing less than an ounce has been creating quite a scene in Central Park, NYC Park Advocates has learned. 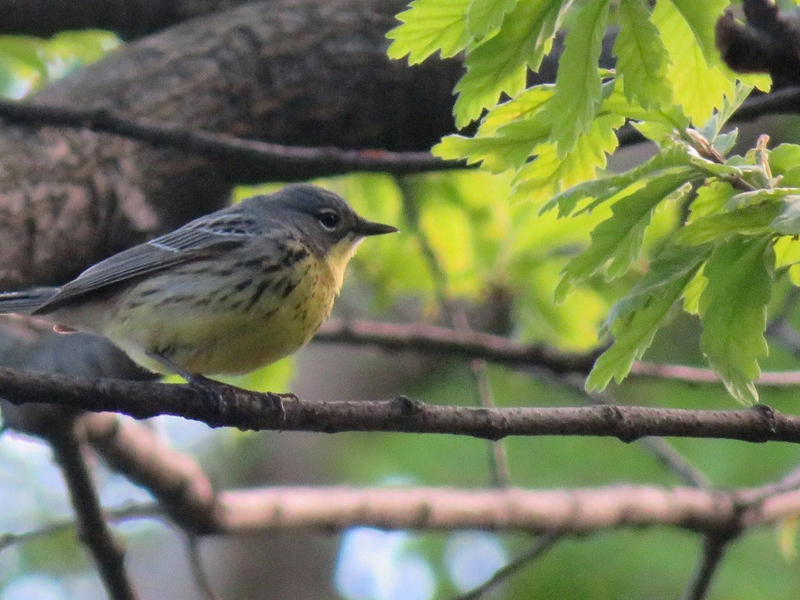 A Kirtland's Warbler, a colorful songbird has attracted thousands of onlookers over the last few days on the Upper Westside just north the park's W. 90th street entrance. Throngs of people have stopped to gaze at the tiny bird visiting our city high up in the trees. 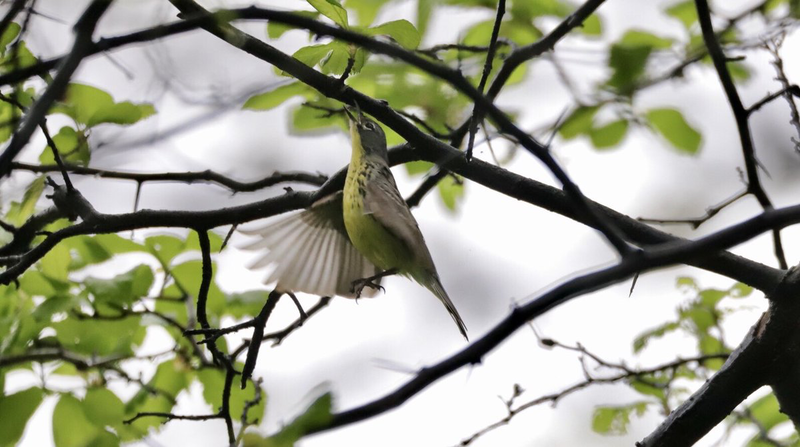 This is reportedly the first time this species had been seen in Central Park and approximately the 4th time it has been seen in New York State. Lengthy reports of the bird's activities are being updated regularly on various birding social media sites. 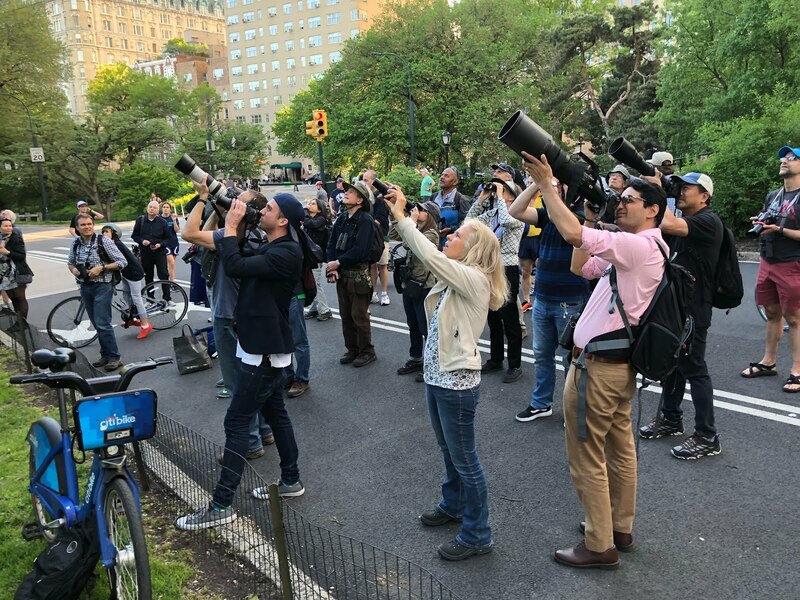 On Friday night large crowds swelled to block much of the park's drive as passerby's joined birding enthusiasts to try and spot the elusive bird. By Saturday the songbird had spread its wings a bit and ventured a few trees away with a gallery of onlookers in tow. On Friday night crowds gathered to observe the rare bird high up in the tree. (Photo: Geoffrey Croft/NYC Park Advocates) click on image to enlarge. It was reportedly observed singing Saturday morning several birders posted on the American Birding Association website. One observer wrote, "Huge Mob present” and warned the public not to play recordings in the vicinity an effort not to disturb it. "PLEASE DO NOT play any recordings of this bird, or others, in the vicinity of this warbler, as many (probably many hundreds) will be wanting to have a chance to observe, visually and aurally this rare species with no disturbance to the bird itself and also no unneeded disturbance to the aural landscape within hearing (i.e. within some hundreds of feet) of this & adjacent birds,” Tom Fiore wrote. “Let's all self-police in this & other obvious respects, in order that order & commonsense is maintained for & by a gathering of birders & others with interest that is sure to grow to very large size,” he said. Kirtland's Warbler in flight Photo By Stephen Rogers. Kirtland's Warbler spends part of the year in northern and central Michigan and migrates in the winter to the Bahamas, and Turks and Caicos Islands. The bird is named after Jared P. Kirtland, an Ohio doctor and amateur naturalist. The Federal U.S. Fish and Wildlife Service recently proposed taking the songbird off the federal endangered list, which would drop its legal protections as their numbers have recovered. 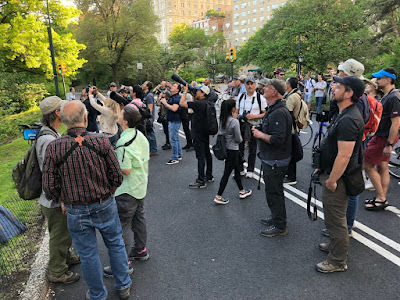 "It’s an extremely rare bird for NYC although just short of a national rarity, as the breeding population has rebounded after conservation efforts,” birder Phil Jeffrey told A Walk In The Park. 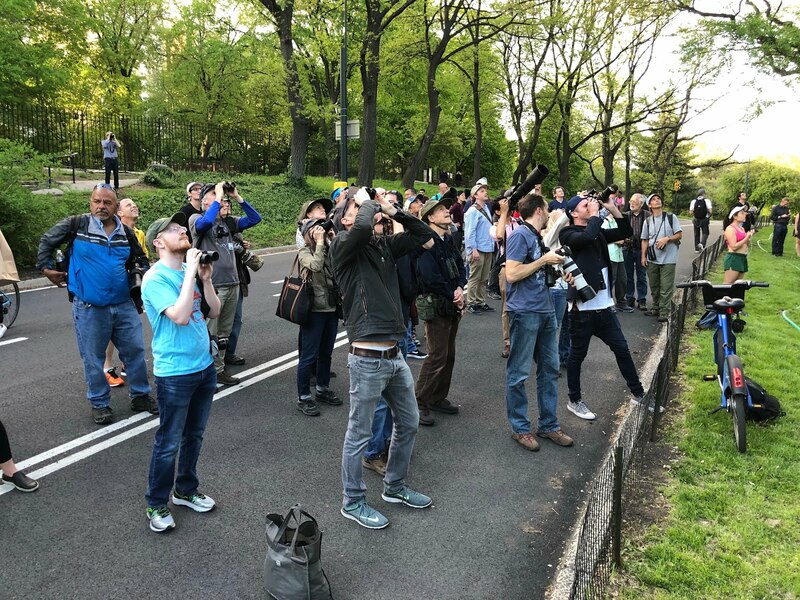 Jeffrey who's been birding for more than forty years and twenty of those in Central Park, said the bird has a reputation of being rarely seen on migration and may fly directly to the Bahamas. "It’s in the once-per-Century level for the park and I would suspect few records in NY State, That’s what generates the attention," he said. "Many other park “rare” warblers have much larger populations, are more-or-less annual but in very low numbers. Kirkland’s is off the scale by comparison." By Saturday the songbird had spread its wings and ventured a few trees away with a gallery of onlookers in tow. Too much excitement for one young passerby. "We didn’t expect it here," said Matthieu Benoit, 33 a molecular biophysics researcher originally from Normandy, France. In the States for almost 5 years, he said he’s been birding since he was eight years old. On Saturday Benoit was paying his second visit in two days armed with an enormous camouflaged camera lens to catch the elusive bird. "It's extremely rare. It's the first time its seen in migration in New York City. To see it you have to go to Michigan or to the Bahamas, and it's not that easy to see it there." He said he found out about the sighting through email and twitter alerts from the birding community. "It was a really good find," he said. One on-looker was overheard saying he had a dream about the bird last night. It is unknown how long the tiny visitor will stick around but most agreed it would not be long. Matthieu Benoit, 33, (center- blue jacket) "It was a really good find," he said. On Saturday onlookers gathered on the bride path to watch the activity. traffic & rapid fire camera's made recording his song problematic. Great to hear him belt out a few tunes, though. Metropolitan Opera ?